The last couple of weeks have been thick with dust. 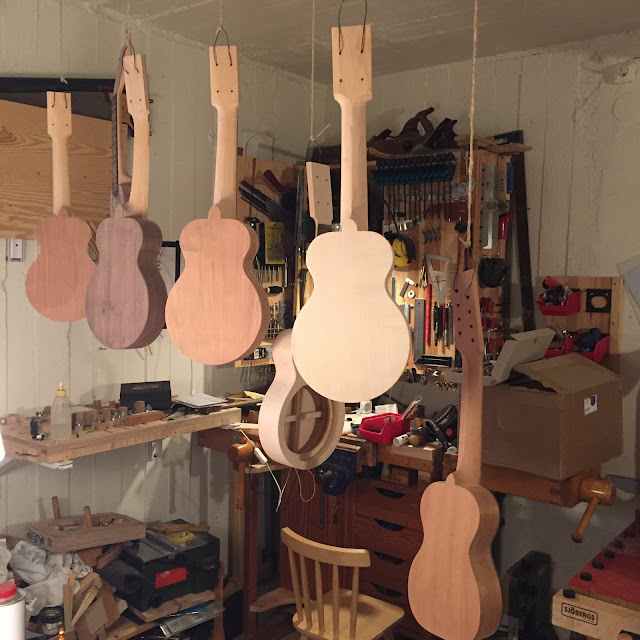 After sanding all seven ukes with the Abranet sanding block I told you about I have used the rolling pin sander to get at the waist areas, and after that I went over all of them with a random orbital sander that begs to be replaced by a better model. But it works, sort of. This is when I round over the edges on the body, and I take care of any knife marks left on the neck. So today I drilled pilot holes for the tuner holes and ground some blonde shellac flakes for one of the maple bodies. For the rest I'll use some darker shellac but this one is requested as blonde as possible. We'll see what happens. 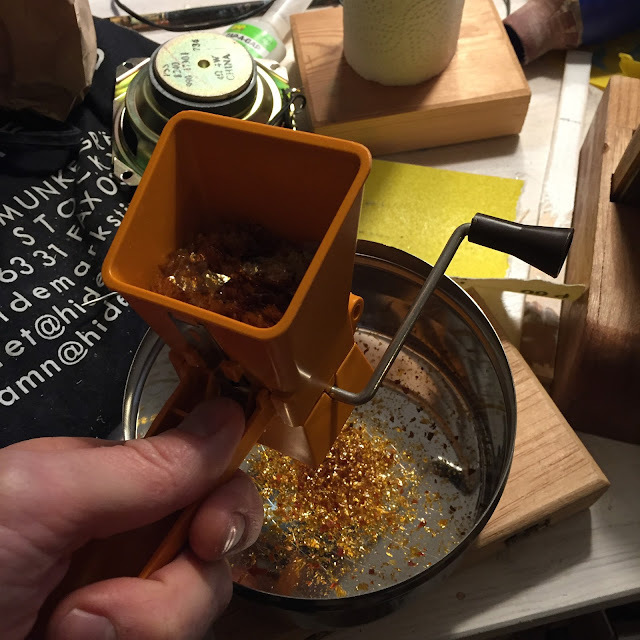 The grinder is some small herb chopper but cuts the flakes as if it was meant for it. I had to make a few extra hooks, and checked that they all hang freely. 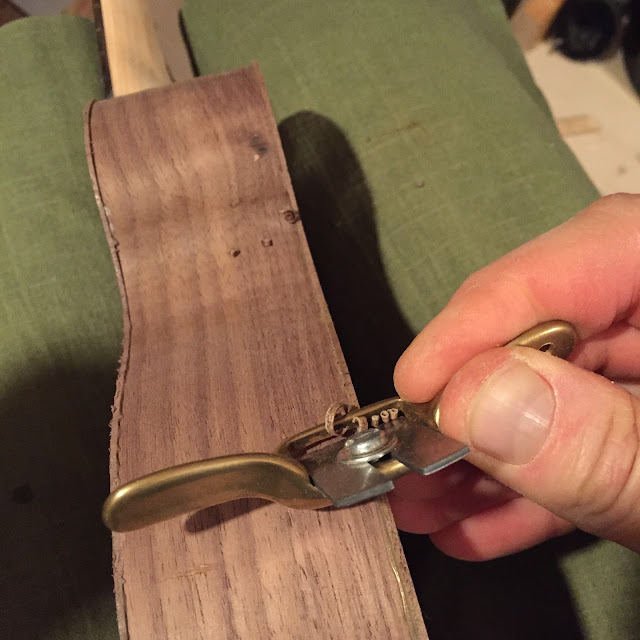 Wouldn't want to stand around with a wet uke in one hand and have to fabricate a hanger with the other... again. *Also the title of one of the best live albums ever. I apologize in advance for what will be a very boring post. But I'm going through the grits and I'm still working on all six resos in parallel. So we will be here a while yet. 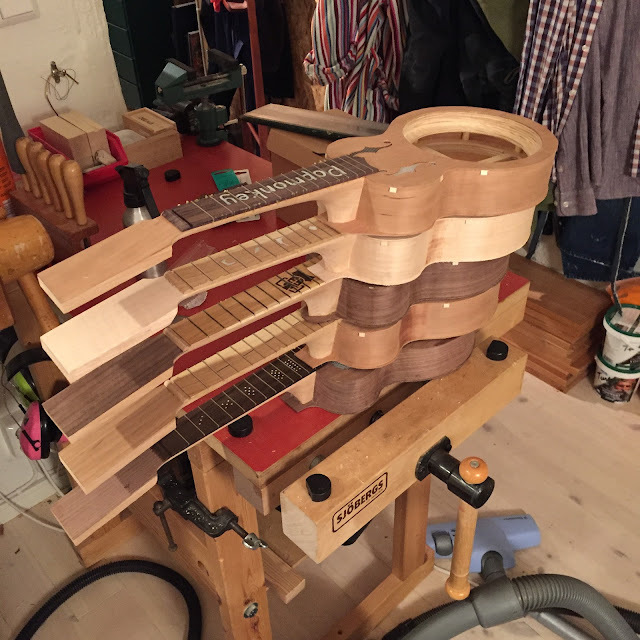 I promise there will be a pic of all six fretboard ends at the bottom though, not that you can't go straight for it right now. 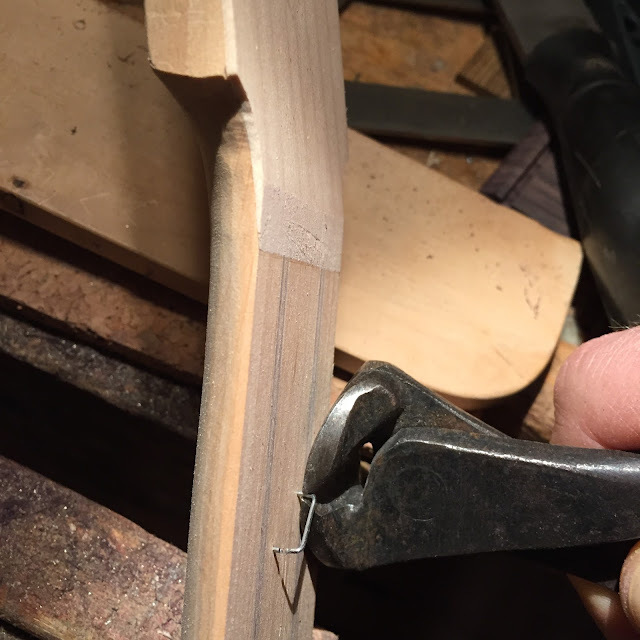 First I trim the overhang on all of them, with my 1 3/4" chisel, a carving knife and a few other tools. Here's one of the small spokeshaves I got from Lee Valley. Not bad but the walnut wasn't really cooperating. 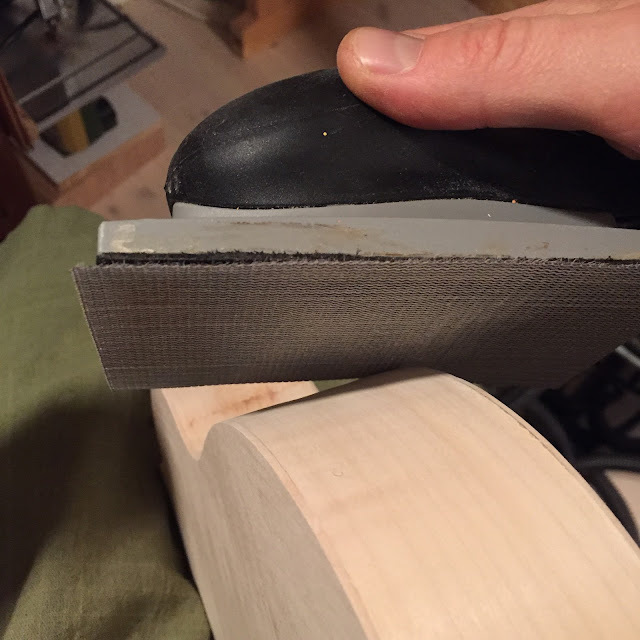 Then after trimming them I started sanding with my Mirka abranet sanding block. It's got a hose at the back so the dust gets out of my face. 45 minutes and two are done to a certain level. I'll do a couple at the time before whipping out the rolling pin sander. That hasn't any dust extraction so I usually use it sitting on the balcony. I warned you it was going to be a boring post! 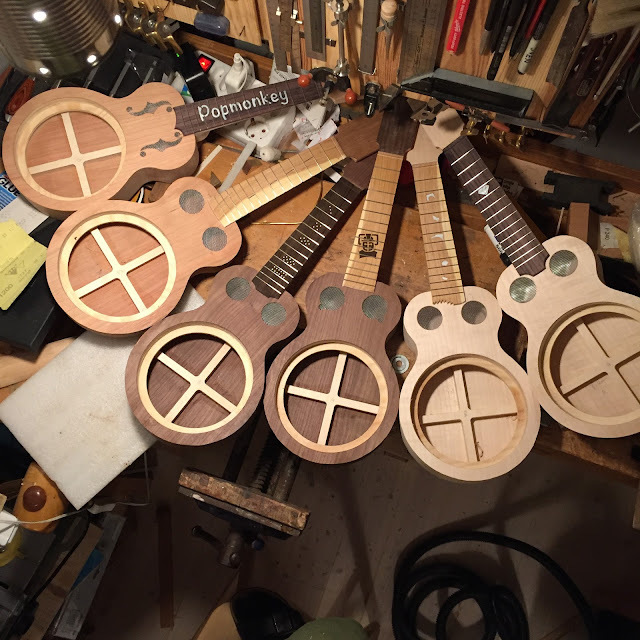 But if you're still with me, here's the picture of the gang with all the different fretboard end shapes. Well two of them do look a bit like each other, I see that now. And despite moaning about this part of the process, I'm quite happy that I've managed to get this far with the whole batch. Can't wait to start shipping them out though, my economy is in shambles and I really want to get on with some other projects. 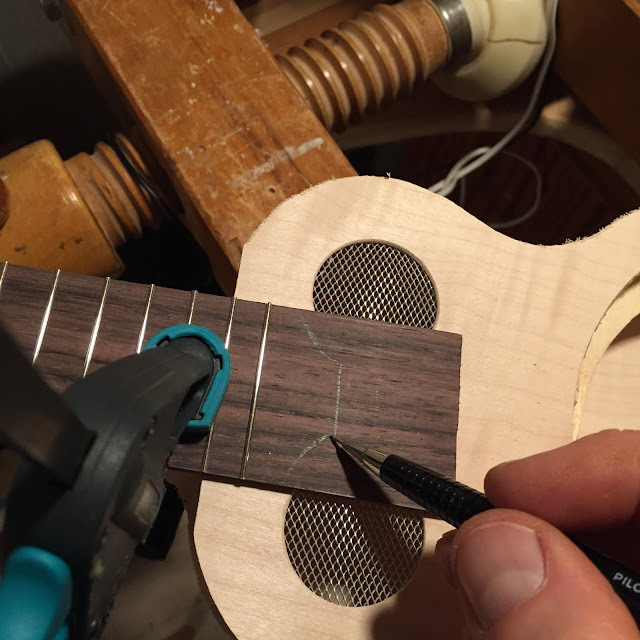 I'm draw filing the edges and fret ends. Once they're straight and flush I check against the neck where it belongs. I want it exact or a smidge narrower than the neck so I can scrape the neck back to the fretboard. 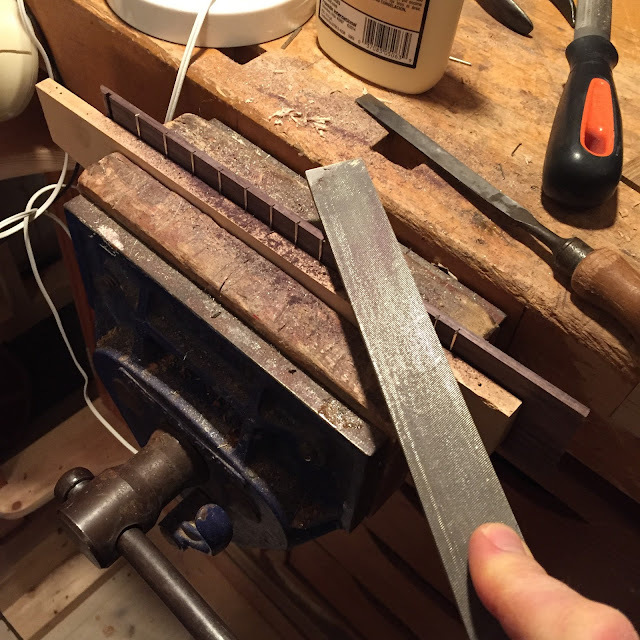 This time I don't bevel the fret ends before glueing, I want to use my new fret end bevelling file. Holding it in place I trace an end shape. 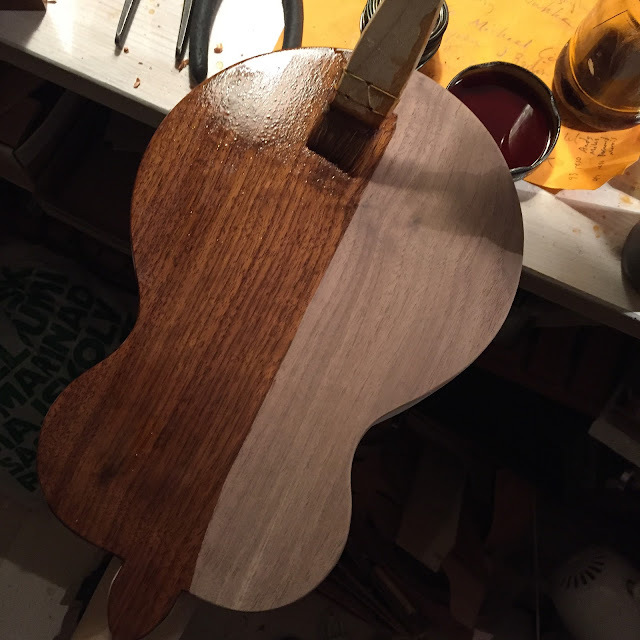 This is the classic Argapa reso fretboard end shape, but strangely enough I haven't used it in a while. 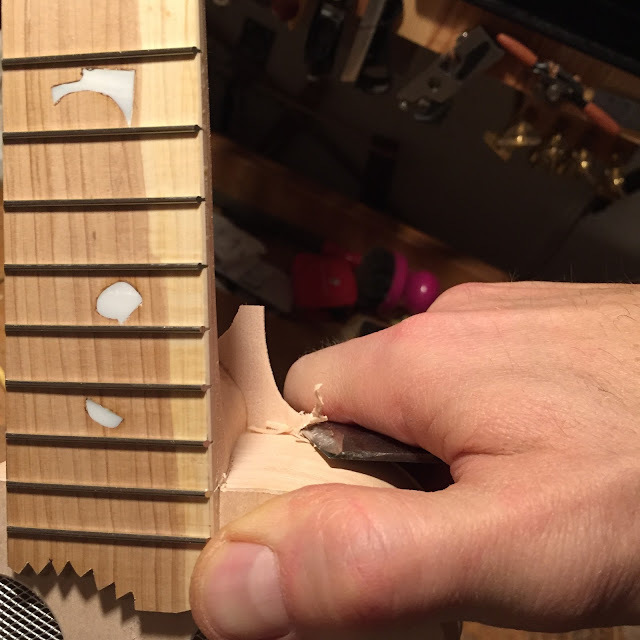 Sawing it out with my Knew concepts saw, then refining the cuts with a Bahco file. But what's this? A staple? Yes. I put teo of them into the neck and cut them off. 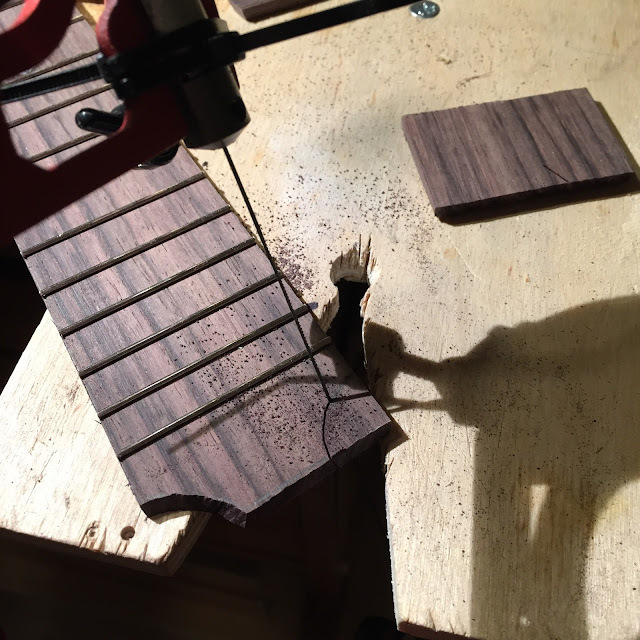 The pointy ends will stop the fretboard from sliding around in the glue. It's important to press the board down so the brads go into the wood before you add the glue. 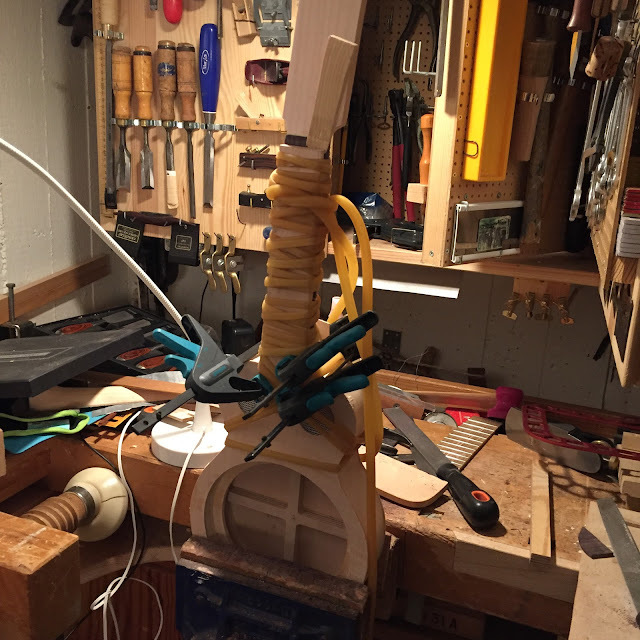 And this is after clamping the fretboard down with the rubber hose, a slotted maple caul, a few clamps and a wedge at the nut end. But what of the rest of the batch? Don't worry, they're all done already. I'll show you the different end shapes next time. A lot of scraping and sanding is next. Woo bloody hoo... sanding.